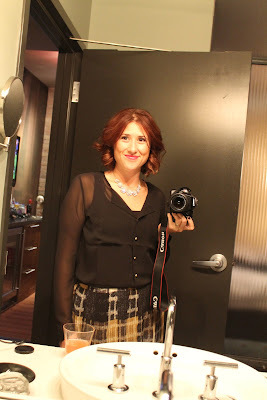 After we arrived at the Iron Horse Hotel in Milwaukee, we enjoyed a tasty complimentary drink and got ready for our night out. We headed over to Harbor House, recommended by my hair stylist Devin. It's a good thing she did because they had the best Lobster Bisque I've ever had. Throughout dinner we had a great view of the Art Museum, so we decided to go walk around over there when we were finished. Even though it was yucky and a little bit rainy out we still had a great time walking around and taking a few silly pics. The lighting in the bathroom was seriously flattering. I would like it installed in every room of my house! After dinner pic with the Mr.